I loved making these baby gifts for my cousin Steph! How cute is that giraffe? 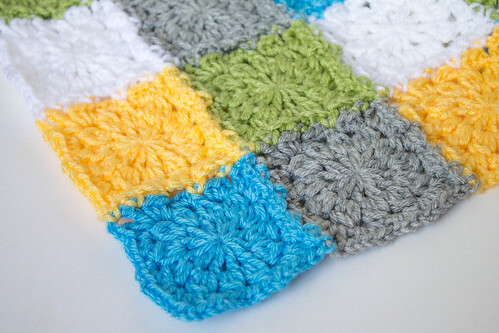 You can find the pattern at I Love Buttons By Emma. Also, with a motif from the Japanese crochet book 300 Crochet Motifs and Edgings, I made the baby blanket that the stripy giraffe looks so comfy on! Want to see more? The specifics: I used Vanna's Choice in Silver Heather, Taupe and White, Vanna's Choice Baby in Duckie, Sweet Pea, and Little Boy Blue and Red Heart in Pumpkin, with a size G (4.0mm) hook. 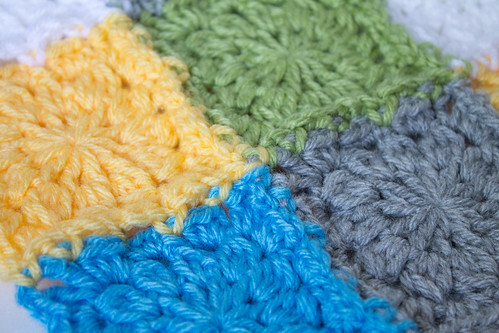 For the baby blanket I picked a simple square motif from 300 Crochet Motifs and Edgings, and used 5 colors (Vanna's Choice in Silver Heather and White, and Vanna's Choice Baby in Duckie, Little Boy Blue and Sweet Pea), and a size J Crochet hook. I joined squares as I went (randomly choosing colors) and made it 12 squares by 12 squares. 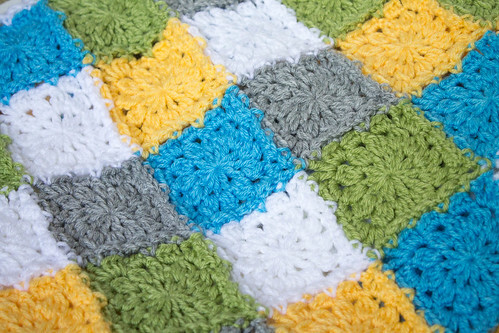 The final size of the blanket was about 41 inches square. After all the squares were joined I decided to leave the blanket without a border. I liked the simple patchwork look of it! It was an easy and fun crochet project! I love projects where you feel like you make progress quickly, (and I really love the practicality of a blanket as well)! Stay tuned for Part 2... another crochet project! It's so cute! Love the colors you used...I'm sure your cousin and baby will love it! Thanks Laura!! 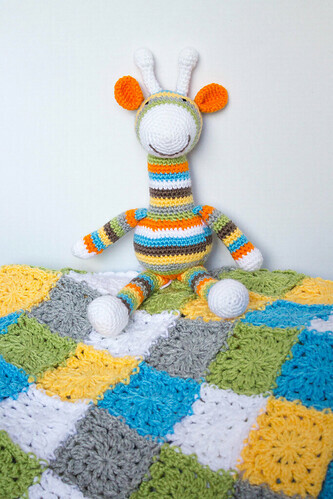 I loved that giraffe pattern after I saw it awhile ago, and was thrilled when I had the excuse to actually make it! What a lovely gift for a new baby! 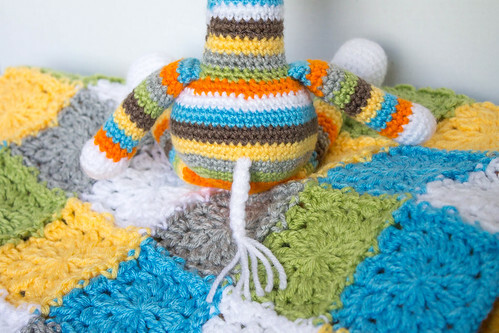 I love the patchwork blanket and that giraffe is so cheeky and cheerful. I like the addition of orange in his stripes and the ears! Thanks Samantha! I'm glad you like the motif I picked, as it took me awhile to find one I was happy with! I wanted something that had a little design to it, but at the same time I didn't want something that had any big holes! you did a great job Kate!!!! I like the blanket so much.......!!!!! !